For any and all members who want to attend this free clinic. expand their anchoring skill set. build and evaluate top rope anchor systems using natural protection (trees, boulders, etc). Building anchors using traditional pro (cams, nuts, hexes, etc) is beyond the scope of this clinic. time permits, you might even be able to squeeze a climb in on an anchor you've built yourself! 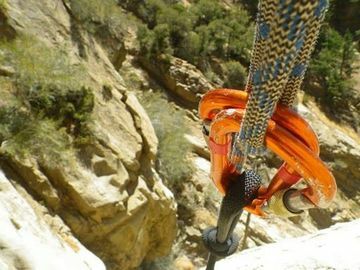 Two (2) Locking carabiners and belay device. heading west (outside of the beltway). lead you up to a stop sign on an overpass. 3. Take a left at the stop sign to proceed over the overpass toward Carderock. 4. Continue straight after going across the overpass. You will soon bear right. 5. Continue through a tunnel to arrive at a stop sign affectionately called the "T". 6. Make a right at the "T" and drive to the last parking lot at the very end. or the person does not show up for the event at all.